Southern Pacific Brewing Grand Opening on Friday! 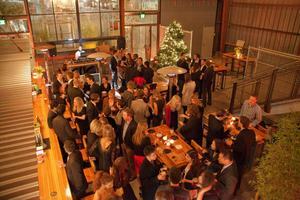 Photo from a holiday party at Southern Pacific Brewing. Photo from Facebook. This Friday January 27th, owners Chris Lawrence and Anthony LaVia are kicking off ~SOUTHERN PACIFIC BREWING~’s grand opening weekend. House-brewed beers by Andy French include pale ale, IPA, porter, golden ale, and wit; coming soon are extra IPA and black lager (all beers $3-$5). The affordable menu of what I’d call California pub fare from chef Tyler Moorish includes a variety of bar bites (pickles, charcuterie, crab fritters), appetizers (barbecue wings with fresh horseradish, salads, “chicken noodle soup” stuffed agnolotti), pizzas (smoked tasso ham with red onion and chile oil, pale ale pork sausage with pepperoni, black olives), sandwiches (smoked pastrami on rye, confit chicken salad), burgers (black and blue with chile rub and bleu cheese), and entrées (lasagne with wild mushroom, sweet onion ricotta, spicy tomato, or steak frites). You can check out the entire menu here. Hours this weekend are Fri 7pm-2am, Sat 7pm-2am, and Sun 7pm-12am. After the grand opening, SPB will be open for lunch and dinner daily, 11am-12am, and open later Thu-Sat. We already covered a lot of the architectural details in the hardhat by Seth Boor of Boor Bridges Architecture, so click if you need a recap. 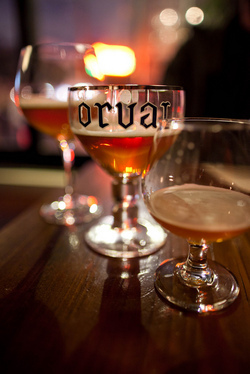 Three vintages of Orval at the 2011 Monk’s Kettle Trappist dinner. Photo from Flickr. 10 straight days of beer-filled festivities: that’s what you have to look forward to for ~SAN FRANCISCO BEER WEEK 2012~, February 10th-19th. As always, the schedule is filled to the brim with beer tastings, beer release parties, and food pairing dinners all over town—and outside of town—so check out the full schedule online. We’ll just mention a couple highlights to get ya started. The beer starts flowing on Friday February 10th with the SF Beer Week Opening Celebration at the Concourse Exhibition Center in SoMa, hosted by the San Francisco Brewers Guild. From 6pm-10pm, 50 NorCal breweries, from new nanobrewers to craft brew legends, will be pouring unlimited samples of new, rare, and classic beers into your commemorative glass. You can also purchase from a range artisan choices and food options, and there’ll be live music. Tickets are online for $65. 635 8th St. at Brannan. The ~MONK’S KETTLE~ is hosting events throughout SF Beer Week, notably the second annual Dinner of the Trappists, an extensive seven-course dinner paired with beers from the monks of the seven Trappist breweries. Starting at 6:30pm on February 13th, you’ll have a rare chance to try beers like the Westvleteren 12 (not available in the U.S.) alongside a course like duck fat-roasted beets with lamb’s lettuce and fromage blanc croquette. Other courses include seared spot prawn with roasted chanterelles and bison two ways; see the full menu here. $195 per person, plus tax and gratuity. Reserve by email. For Valentine’s Day, Tuesday February 14th, visit Monk’s Kettle for a “Sweet and Sour Valentine,” featuring a sour beer known as Cantillon Rosé de Gambrinus. Rosé like the wine, yes, but it’s a beer. They’ll also have sweeter offerings, like Dieu du Ciel! Aphrodite, to represent the other end of the spectrum. In honor of SF Beer Week, ~ANCHOR &AMP; HOPE~ is holding a Shrimp Boil on Thursday February 16th, 4:30pm-7pm. It’s an all-you-can-eat, all-you-can-draft kinda thing with three brewers (Anchor Brewing, 21st Amendment, and Pacific Brewing Laboratory) and 16 of their drafts. $30. Give ‘em a call to RSVP: 415-501-9100. The bar at Jardinière. Photo: FrankenyImages.com © 2010. 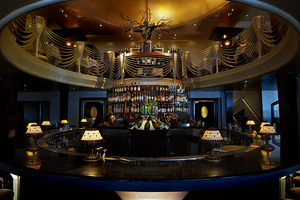 A few quick updates: first, swing by the bar at ~JARDINIÈRE~ this Thursday January 26th for a cocktail from guest bartenders David Lytle and Stephen Bassman from Frommer’s Travel Guides. They are serving dueling Manhattans ($9 each), and there is going to be a special pastrami slider, also $9. Proceeds go to Family Builders. 6pm-8pm. Over at ~HARRY DENTON’S STARLIGHT ROOM~, bar manager Joel Teitelbaum has put a carbonated, pre-bottled Negroni on the menu (it’s the first of what will likely grow to become a separate carbonated section of the menu). The Negronis are carbonated and sealed in a 375mL bottle, and opened and poured tableside over a glass of ice with an orange garnish. Fizzy Negroni, sign me up. Sir Francis Drake Hotel, 21st floor, 450 Powell St. at Sutter, 415-395-8595. Alcademics has all the details on the latest incarnation of the sherry-centric cocktail program over at ~GITANE~ by lead barman Ramon Garcia (“with some aid from Neyah White [formerly of NOPA]”). Of the many new drinks, there’s a Sherry Shrub, and a Smoked Palomino with crema de mezcal, amontillado sherry, grapefruit, lime, and soda water. And over at ~QUINCE~ and ~COTOGNA~, wine director David Lynch’s replacement has been named: Chris Baggetta of New York’s Eleven Madison Park. She begins February 6th as Lynch’s St. Vincent project in the Mission gets underway. Note: the press release states Cotogna’s $40 by-the-bottle and $10 by-the-glass selections will continue.